For years there has been growing evidence that toxic chemicals from Alberta’s vast tar sands tailings ponds were leaching into groundwater and the nearby Athabasca River. The tailing ponds now cover a huge area – some 176 square kilometres – and given their size it is hardly surprising that some seepage may be occurring. But some estimates say it could be a huge amount of pollution, with 6.5 million litres leaking a day from a single pond. And although the oil industry has acknowledged that seepage might be an issue, they have tried to argue that it is indistinguishable from naturally occurring bitumen deposits and therefore we do not really know the size of the problem. Now a team of scientists from Environment Canada have been fingerprinting the toxic and cancer-causing chemicals to tell if they are natural or from the tailings ponds. The study, conducted under the tar sands monitoring project, has been accepted for publication in the journal, Environmental Science and Technology. 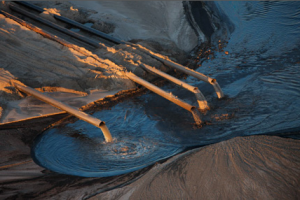 And what the scientists found could have huge ramifications for the tar sands industry. They have proved that the tailing water is polluting ground water and seeping into the Athabasca River, although they do not quantify by how much. “With some of the groundwater samples containing chemical profiles similar to tailings ponds, this is the strongest indication to date that process water is reaching the river system,” said Richard Frank, lead author of the paper. “Well, it looks like what they’ve seen is that in fact the tailings ponds are leaking,” Bill Donahue, an environmental scientist with the tar sands advisory committee told the Canadian media about the findings. However the oil industry and Canadian government, in language reminiscent of the tobacco industry, argues that the science is not conclusive and more evidence is needed before action is taken. For years the tobacco industry argued that the science was not certain about the link between smoking and cancer. The Canadian government is beginning to act like the tobacco industry – putting industry profits before the health of the local people. Now one Albertan New Democrat Rachel Notley, is now arguing that the Federal government should not approve any new tar sands projects until they can be sure that the tailings ponds are not leaking. But stopping expansion is the last thing on the Federal Government’s minds. I am so disgusted with the images of the Alberta Tar Sands. When are these oil companies going to STOP polluting our planet, killing our birds, and destroying our beautiful land. I am so afraid for our world when companies / people don’t think long-term for the future health of our planet. They use their money to make selfish decisions. Do they not have children? How can they not care? God please help us all. I can’t believe the government would allow first nation’s people to lose their entire lifestyle. It was the government who gave them rights and now their destroyed. As my dog, jimmy, is a first nation’s dog I would feel horrible if he couldn’t eat out of his bowl just because someone bleached his bowl when I wasn’t looking. Money controls a lot of the world’s problems, so now let’s use it to end world problems. If someone offered you $5000 to fill my dog’s water bowl with toxic water, would you? I would to be honest. Ignore my argument I actually changed my mind. I believe the government should be able to do this, i like money.